Bill Gates once said – or at least the internet told me Bill Gates once said – that he will always choose a lazy person to do a job, because they will find the easiest way to do it. Handed a job by his father, and born with both a proverbial and literal silver spoon in his mouth, Samuel is that person. And yet, in Manuel Samuel from developer Perfectly Paranormal, you’ll find yourself putting in a profound amount of effort to even stay upright in completing the most simplistic tasks, in turn triggering a series of catastrophic events. Wake-Up Call: The game will test your timing with varying button-prompts, each inflicting pain upon poor Samuel if not executed well enough. Manual Samuel puts in you in control, and I mean complete control, of self-absorbed socialite turned marionette Samuel, who after a rather brutal traffic collision, (and a run-in with death himself – who looks like he’s just stepped out of Tony Hawk’s Pro Skater) is left having to fend for himself for a whole 24 hours in order to overcome his deal with the devil. Gameplay is somewhere between the inevitable failure of (browser game) QWOP and the hilarious environmental debacles of Octodad, and I can only liken it to trying to rub your tummy and pat your head at the same time. Even the most mundane of tasks, such as brushing your teeth, or putting on pants, become an infuriating impossibility, as you’re having to constantly blink, breathe in and out, keep your balance and walk one foot after the other. Juggling multiple limbs at once is irritating, and the devs know this, which is why they throw in a ridiculous, sarcastic story to keep you smiling even through the frustration. The narrator in particular catalogues your every move in sarcastic, fourth-wall breaking jest, and his quips have you laughing at Samuel’s misfortune rather than groaning at your failure. A clever trade-off. The ending rant from the narrator had me laughing aloud as the credits rolled, and it’s almost worth playing through the game just to hear that. 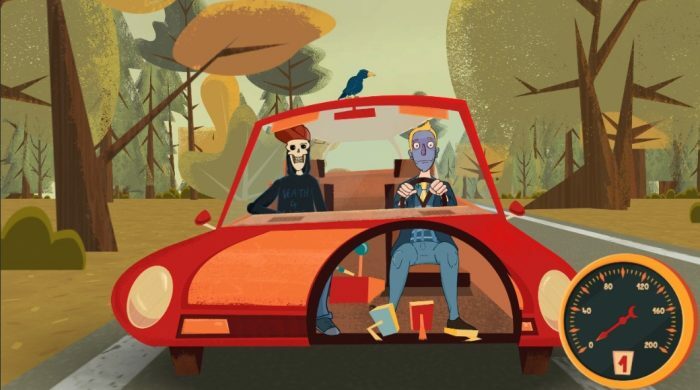 Driven up the wall: Death really is the worst backseat driver ever. Eyes on the road Samuel. The Switch port of Manual Samuel is handled extremely well, and it performs perfectly painfully in both handheld and docked modes. The devs also make good use of the hardware features too; you’re able to use the motion controls to lift Samuel to his feet, and the HD rumble alerts you when his spine is moments away from snapping like a wet breadstick. At this rate you’re almost putting in as much graft as Samuel himself, and I guess that’s the point. Manual Samuel is a pretty short, linear experience, but it’s well polished and lasts just long enough for the joke to not get old. For those wanting an even more hellish challenge, within the vibrant menu system (that features a bunch of its own original artwork) there’s a built in achievement system and speed-running options. It’s a nice offering, but I’d just about reached the end of my tether at the end of the main story. Hell of a day: Sam’s day goes evidently downhill, and here you can see him fighting a demon from within another demon. Manual Samuel ‘s brain teasing gameplay is not something that I’m clamouring for in every Switch title, but it’s a fun and humorous concept, carried well by nice visuals and a hilarious narrator. 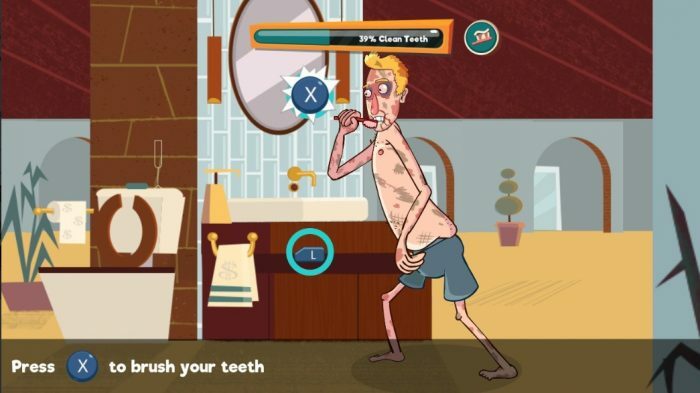 Manual Samuel is a fun but irritating experience, and that’s the point. A patience test that literally makes it difficult to put one foot in front of the other, its charming cartoon graphics and hilarious narrator contrast nicely with the gameplay, and it changes things up just enough to keep you entertained to the end.